March 8 is International Women’s Day, a time to celebrate the social, economic, cultural, and political achievements of women. International Women’s Day was first celebrated in 1909 in the United States, and was officially designated as a worldwide holiday by the International Women’s Conference in 1910. The founders of this conference were socialists and communists who wanted equity for women’s contributions to the workforce, particularly in the garment industry, where women worked for 12 hours a day in hazardous conditions for very little pay. Celebrate women who have fought winning battles for human rights. International Women’s Day also praises women who have fought to gain voting rights around the world. Citizens of the United States are (or at least should be) aware of American suffragists like Sojourner Truth and Susan B. Anthony, whose efforts culminated in the 19th amendment of the Constitution, giving American women the right to vote in 1919. 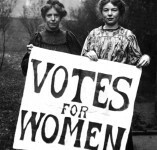 We should also honor the struggles of women in other countries to get the right to vote. For instance, Sylvia Pankhurst was a leader of the British suffrage movement, and was active in the labor movement as well. Many of us take the right to vote for granted, but let’s not forget that women in Saudi Arabia were unable to vote until 2015, and they weren’t even allowed to drive a car until the Saudi royalty decreed that women could start driving this year.